Within moments of jumping into the sled, your mind enters a state of peaceful hyper-awareness. You grab a hold of the D-rings, and much like an orchestra conductor elegantly and effortlessly moving her hands to produce a particularly desired sound, yours perform the implicit procedural tasks necessary to navigate yourself smoothly down the icy track at speeds faster than the legal limit on most highways. As you enter curve 10, 5x the force of gravity can be felt down your neck and along your spine. A rush of frigid air cuts through the vents in your helmet producing a slight fog in your visor. Fortunately, you’ve traversed this mile-long track of ice many times before, and the fog does little to distract you or impede your ability to feel the speed and control of the sled in your fingertips. It’s a rush like none other, only achieved through the most meticulous preparation and precise of movements. For 58 seconds, your mind performs millions of calculations, a majority of which unconsciously. One minor error in “mental rounding” and… CRASH!!! My name is Tyler Hickey, and I am a Data Scientist at Syntelli Solutions. In addition to my work at Syntelli, I am also a pilot on the U.S. Bobsled Team, training for the 2022 Winter Olympic Games in Beijing, China. If you’re wondering, “What the heck is a data scientist doing in a bobsled?”, I ask myself the same question every day. In fact, if you were to estimate the number of people in the world who 1) Studied mathematics, 2) Played college football, and 3) Went on to become a bobsledder… the answer would probably be one. In other words, it’s just me. 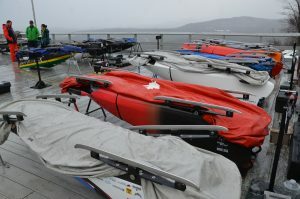 I make this point to articulate the fact that when I look back on the past 4 years, I have NO rational explanation for how a data scientist found himself siting in the driver’s seat of a bobsled… The reality is that in a sport with roughly 200 athletes worldwide, almost none of us followed the same path, and just about all of us find ourselves asking the same question, “How did I get here?”. If this sounds confusing, here is a thought that I’ve had over the past couple of years that may better bring this pseudo-math to life. I use this quote quite often to describe my experience as a bobsledder, and as far as I know, it’s the best way that I know how. At first glance, the contrast between the hyper-masculine traits and the seemingly disinterest in self-preservation of a bobsled athlete, and the analytical and rational features of a data scientist, appear too significant to reconcile, but finding a connection between my sport and profession has been much easier than I anticipated. In its simplest form, the sport of bobsled is just one big, dangerous physics experiment (you just happen to play a part in it). Your job as a bobsled athlete is to accelerate a roughly 400 lb object for 50 meters, jump in said object, and then navigate that object down a mile-long track of ice and concrete faster than the rest of the competition. Once you jump in the sled, gravity becomes your friend, and friction and drag become your enemy. Fortunately, or unfortunately, gravity is what we would call a “consistent” friend (no pun intended). It will accelerate you down the slippery slope of the track at a constant rate, no more and no less, and in the same way that it does for everyone else. On the other hand, friction and drag can be combatted in several ways. First, let’s talk about friction. Drag, on the other hand, is an entirely different animal. As an athlete, there is only so much that you can do to combat drag. The most significant contributor to the drag experienced during a bobsled run is the aerodynamics of the sled itself. Other than riding position and covering up any holes with duct tape, there is very little that the athletes can do to minimize this force. 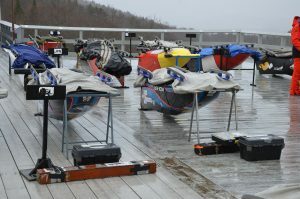 In reality, drag is something that we as a team work to reduce in the offseason through investment in highly advanced sled engineering and wind tunnel testing (The same kind of wind tunnels used to study the aerodynamics of jet airplanes and racecars…SCIENCE!!!). The amount of data produced from a single 30-minute session of wind-tunnel testing is enough to make your head spin. We continue to alter various aspects of the sled by ¼’s of an inch until drag is minimized. 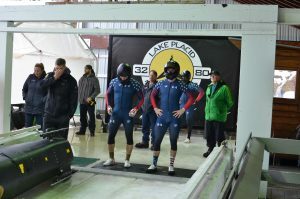 Even the tiniest alteration to the sled can affect the down time of a bobsled run by .01 of second, and in a sport where races are determined by less than .10 seconds, these small improvements in aerodynamics add up and can be the difference between a Gold Medal in the Olympic Games or placing in the middle of the pack. 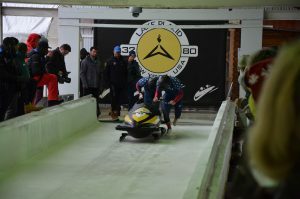 The connection between data science and bobsled is much stronger than one might initially think (Certainly more than I believed would be the case). 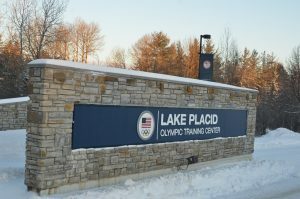 It’s a tremendous honor to compete for the U.S.A. at an international level, and it just so happens that the intersection between data, science, and sport present in bobsledding brings many aspects of my life full-circle. Yet, the same thing can be said for most things. The truth is that data science, physics, and mathematics play a roll in nearly every decision, emotion, and experience in our lives. They do not detract from our experiences as humans, they just simply help to explain them… and hopefully improve them in the future. For example, no two runs in a bobsled are the same: Sometimes they are faster, sometimes more chaotic, and other times you find yourself upside down, peacefully crashing down the mountain at 85 mph with nothing but a burn vest and helmet protecting you from serious injury, ice burns, or death… (If that doesn’t sound like living, I don’t know what does). So, its important to use data to identify what causes these differing kinds of experiences. In my sport, I use data to save fractions of a second in a race, as well as for safety, but in my professional life I use the same principles to improve health outcomes within hospitals and to maximize the efficiency of complex financial systems. For me, life is about balance, and what more logical way is there to balance the life of a data scientist than barreling down a mountain at ridiculous speeds on a brisk -30 degree day.